The Paton House deserves its own post. 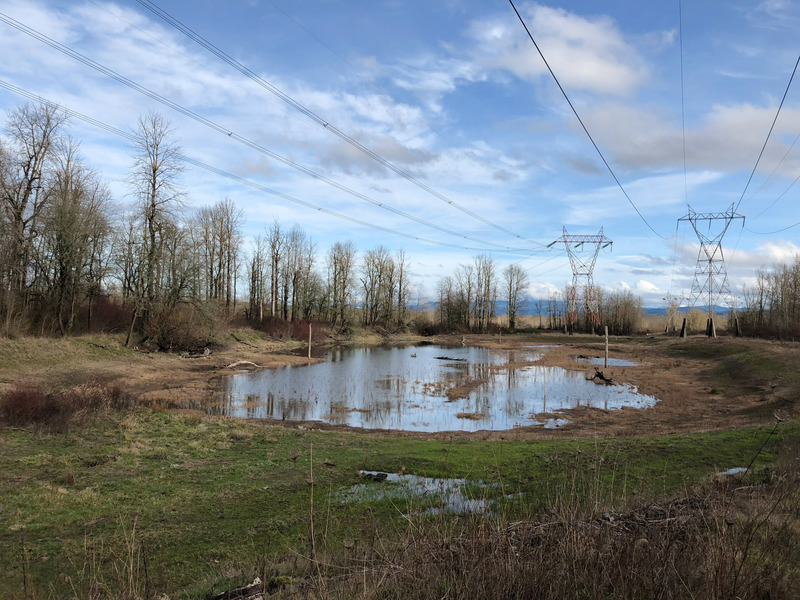 It was started by generous homeowners, Wally and Marion Paton who loved birds and set up feeders, a chalk board for sightings, and invited birders to their yard beginning in 1973. After their passing, the property was picked up by Tucson Audubon to preserve the scenic location as a haven for birds and birders alike. It warms my heart that such a place like this exists. We made three visits in our five days in Patagonia and we saw 45 species, including lifers for all of us. And we closed the place down each time we went. It was that good. At the Hummingbird feeders were Anna’s, Broad-billed, and my lifer Violet-crowned Hummingbird. On the suet in the trees were gobs of Yellow-rumped Warblers,White-breasted Nuthatch, and Ladder-backed Woodpeckers. Sometimes all at once. On the thistle was an out of season American Goldfinch, Pine Siskin, and Lesser Goldfinch, including one of the “Texas” varieties with much more black on its back. The seed feeders (surprisingly) attracted Lazuli Buntings. And one evening, my lifer female Blue Grosbeak shyly came out for a visit. 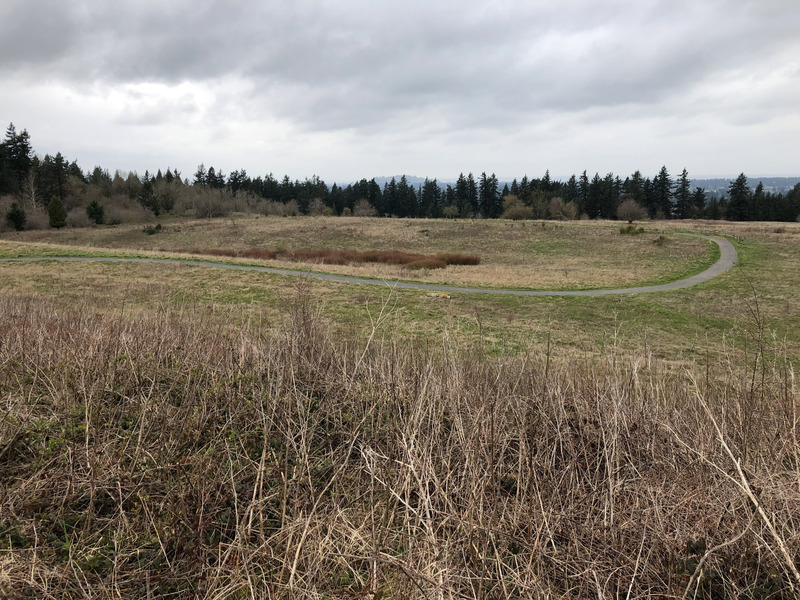 In the brush piles below were White-crowned Sparrows, Lincoln’s Sparrows, Chipping sparrows, and Rufous-winged Sparrows. That totally didn’t look like Chipping Sparrows. Nope, not at all. Gambel’s Quail would call “pup waay pop, pup waay pop” as they scratched around in the dirt and perched on brush piles. Like clockwork in the evening a female Pyrrhuloxia would cautiously join the other ground feeders for a snack. 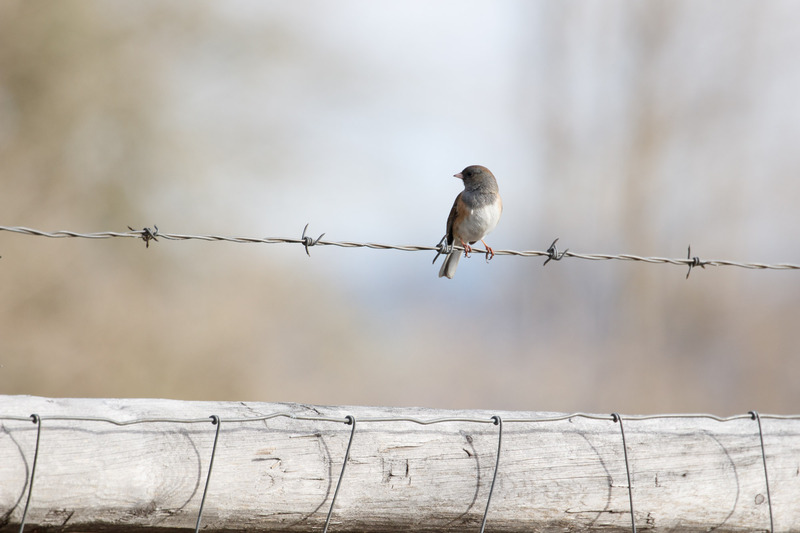 We spent enough time here to get to know some of the regular birds and their habits. One time Sarah spotted a pair of Inca Doves near a brush pile, they are so tiny, they made the White-winged Doves look like behemoths. In the skies above Max spotted (his and Sarah’s lifer!) a Gray Hawk circling above. (I’d seen one once before in Texas). 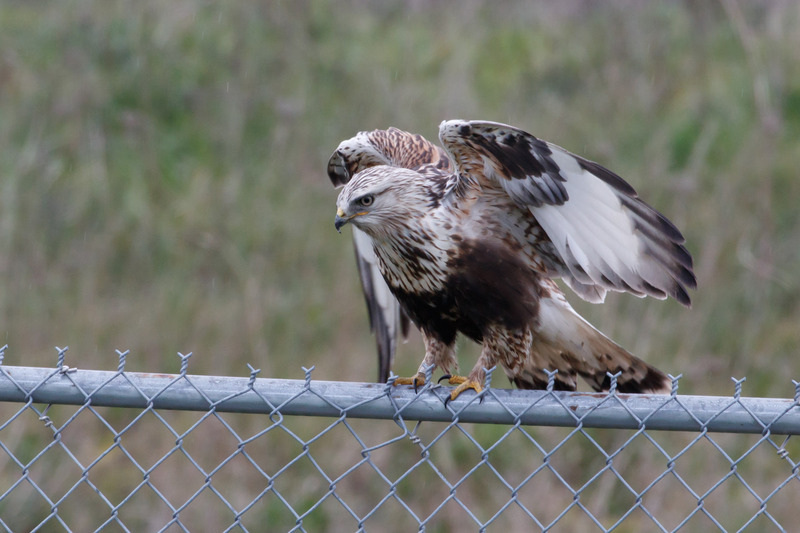 And on our last day, with no other expected life birds on the horizon, Max left to get something out of the car then came running back to alert Sarah and I because he thought he’d seen a Zone-tailed Hawk mixed in with the Turkey Vultures in the sky! Sure enough! Life bird for all of us! It was a very lucky sighting. And a very lovely time at Paton House. Thank you Wally and Marion. “You’re a trooper” “You got some heart” “You’ll let nothing stop you” “Way to go!” “Are you okay?” These are the things people will say to you if you hike up Powell Butte Nature Park on crutches. I know this because I tried to find one of 11 Mountain Bluebirds spotted the day before, but unfortunately, all I found were well-meaning platitudes. At least it was good exercise? I suppose. 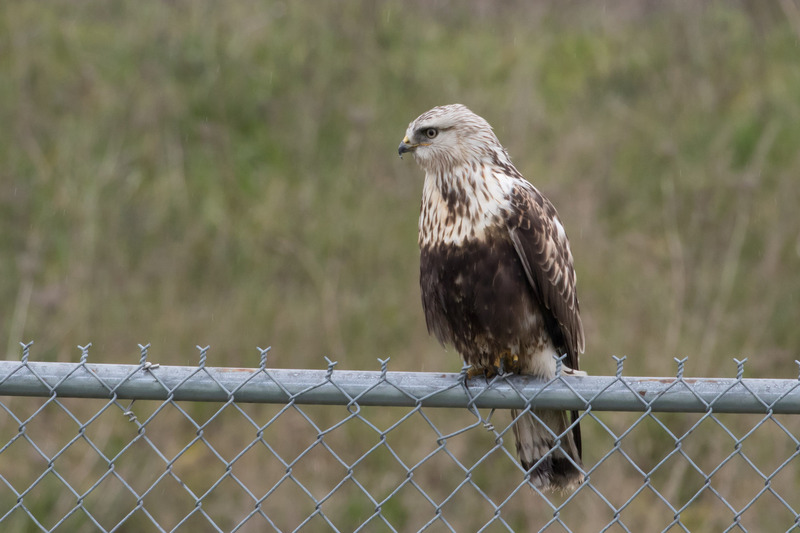 I feel I’d gotten cocky after convincing Tomas to drive by the fire station near Broughton Beach to look for a Rough-legged Hawk that’d been seen there. Found it! Birding is so easy! Of course it is. 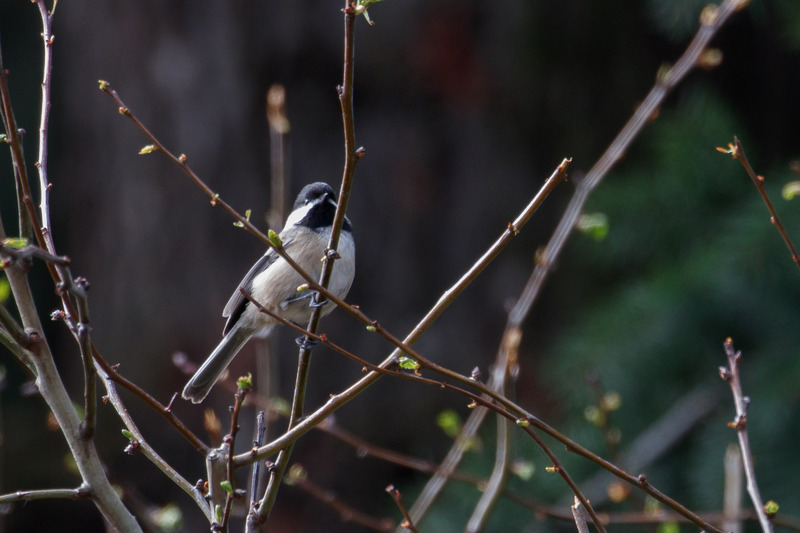 Most of my time this past weekend I spent hanging out with the yard birds, especially after I saw a Black-capped Chickadee show interest in a nesting box I put up last year. After many hours of watching though, it’s still unconfirmed if they’re using it. Are you nesting here? Check yes or no. 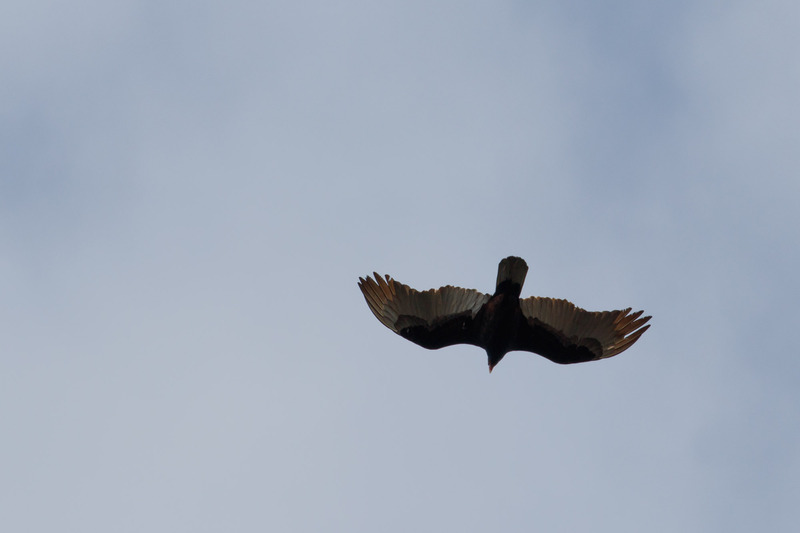 Another highlight while sitting outside enjoying the spring sunshine was witnessing a wake of Turkey Vultures fly overhead. This is the first time I’ve recorded them from the yard and I counted 20! They just kept coming. This is the kind of stuff that makes yard-birding interesting. 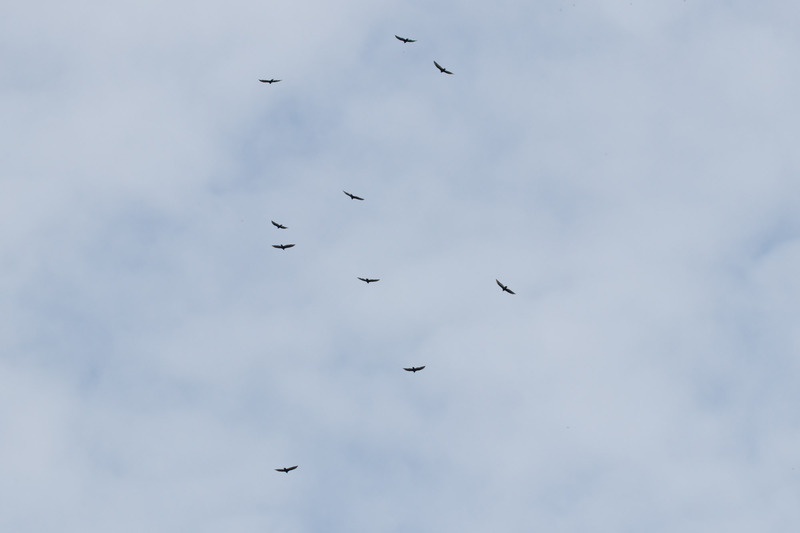 While vultures migrated overhead, other birds were singing up a storm. 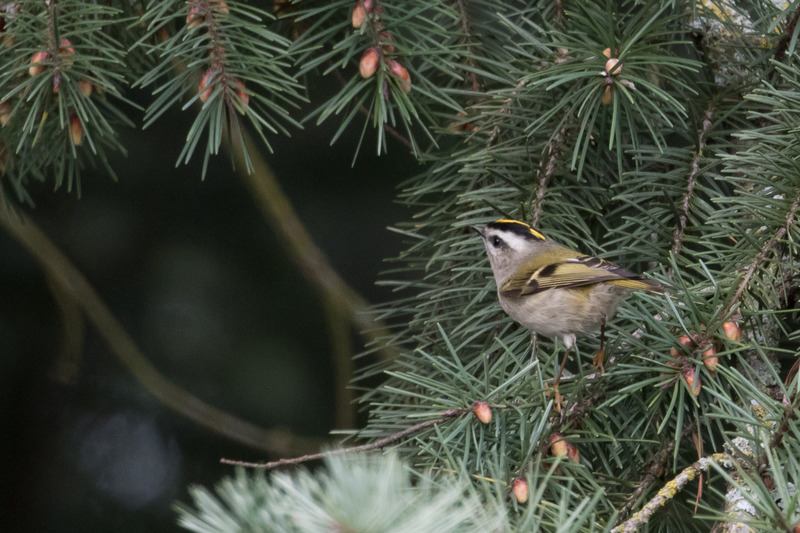 I heard Varied Thrush, Ruby-crowned Kinglet, and Golden-crowned Kinglets jingling in the Doug-fir trees surrounding the yard. 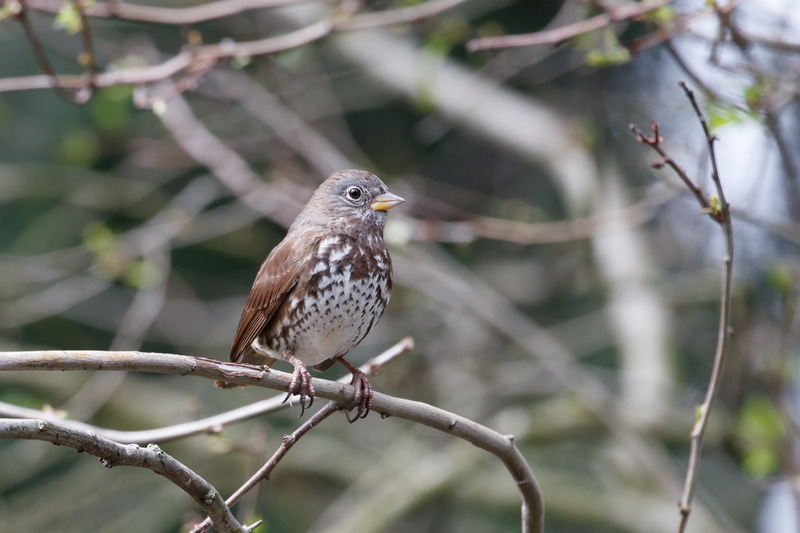 I heard a handsome Fox Sparrow. 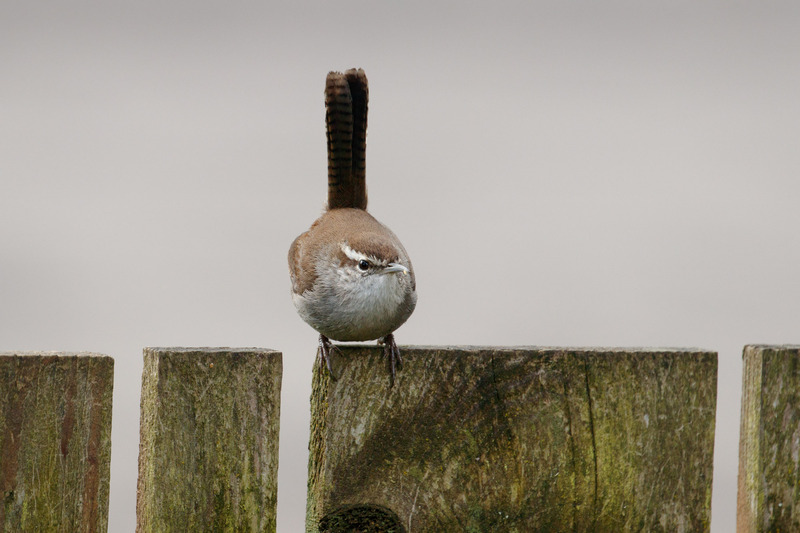 And a charming and perky-tailed Bewick’s Wren. 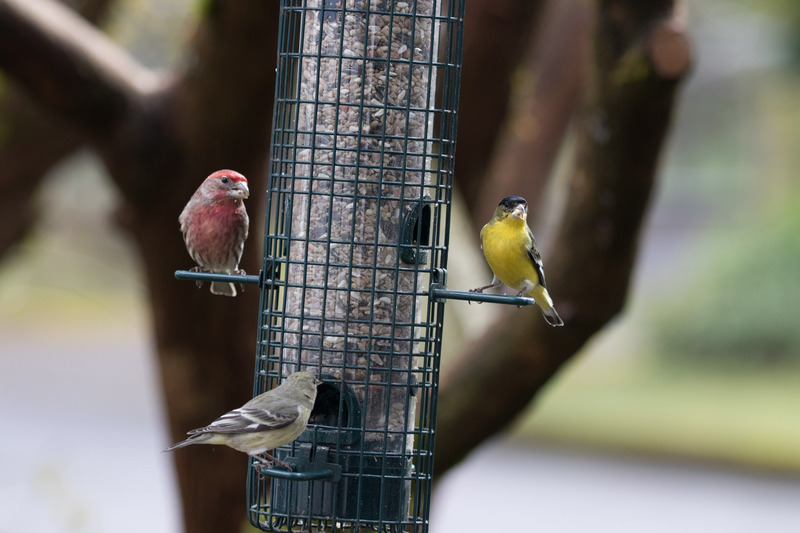 At the feeders House Finch and Lesser Goldfinch add some color. 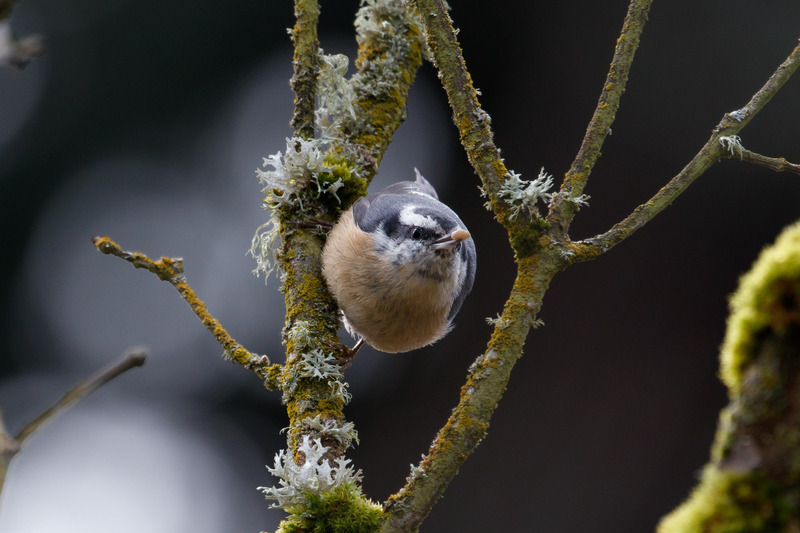 While the Red-breasted Nuthatch adds personality. 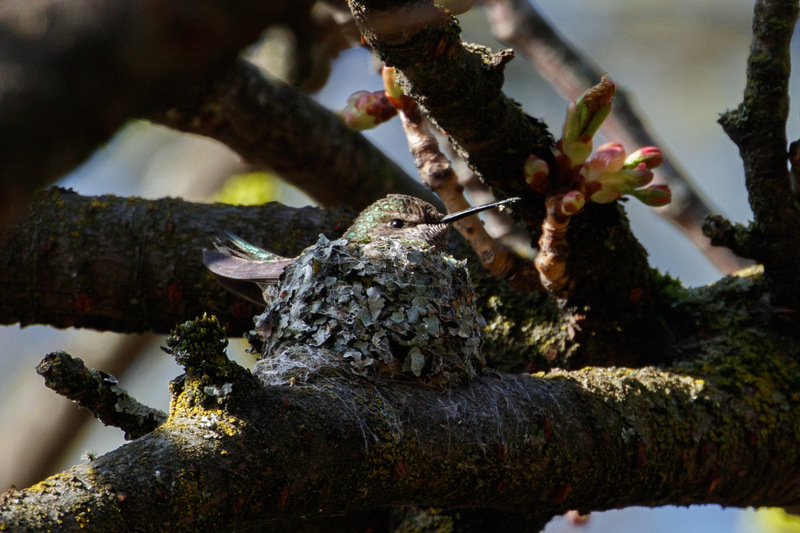 At the office I’ve spent more time watching the Anna’s Hummingbird nest than working. She’s made regular feedings, but I haven’t seen any little hummers yet. I’ve also yet to see a Rufous Hummingbird this year, but there’s still time. 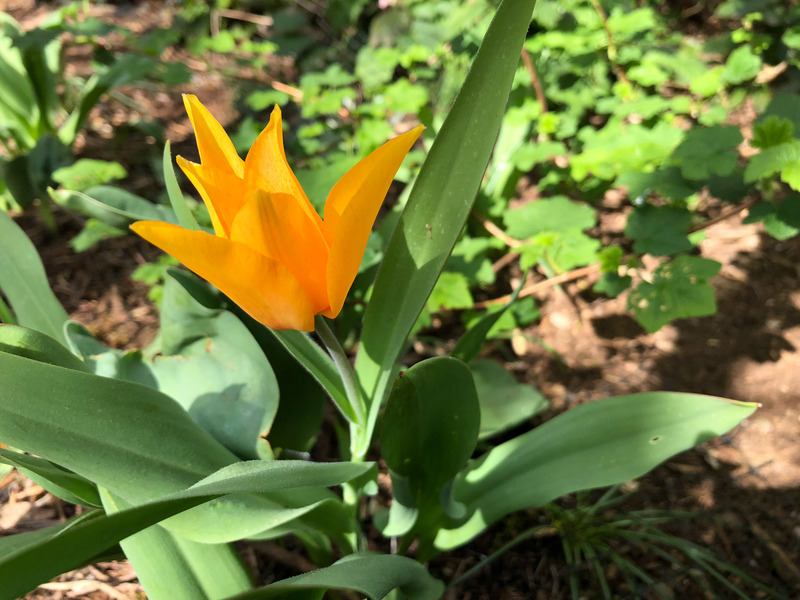 The flowers have just sprung. 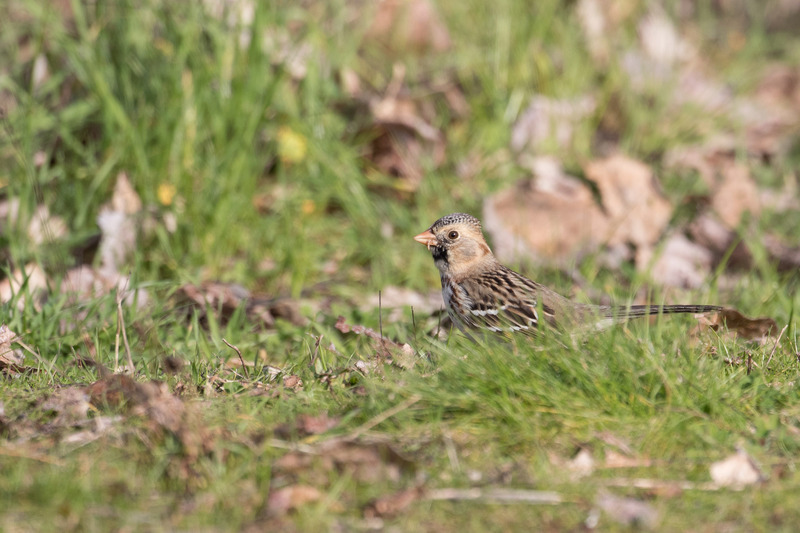 I birded so efficiently at the coast it left me ample time the next day to look for a rare Harris’s Sparrow. 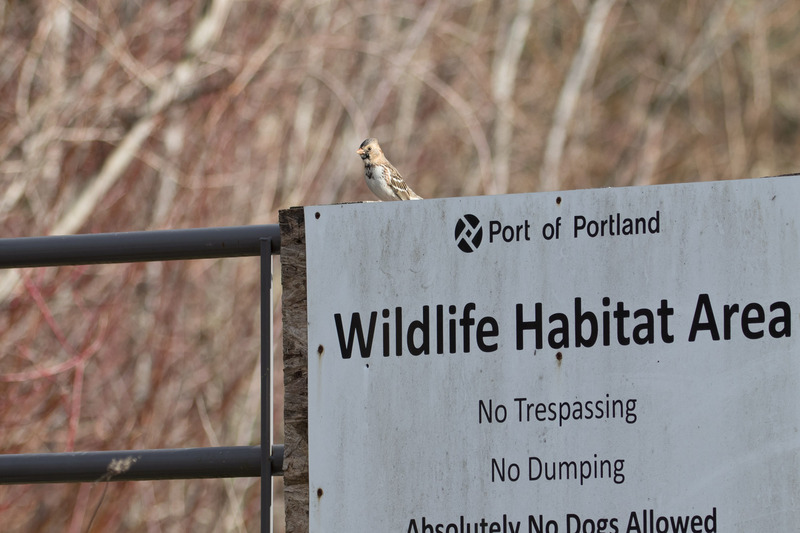 It was a first-year bird found by James Cook along Sundial Loop Trail near the Troutdale Airport. It’d been a while since I birded this hotspot. 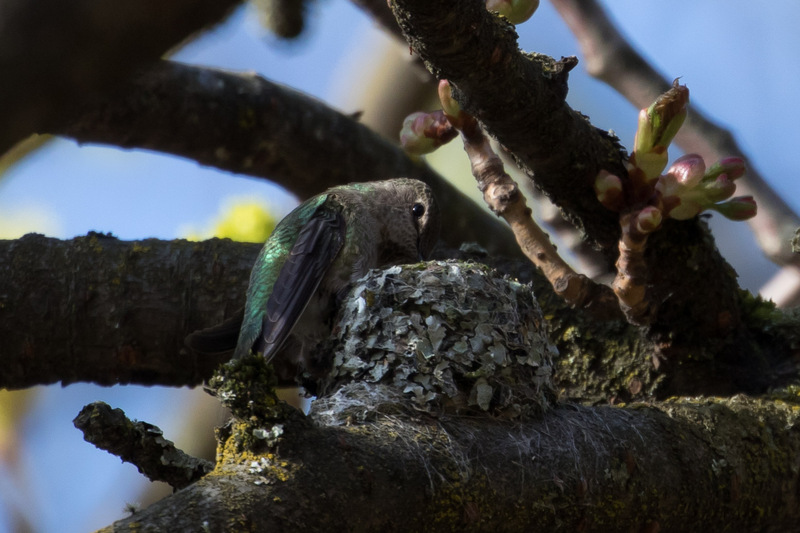 My first trip in the spring of 2015 I biked there and saw my first Rufous Hummingbird and found a Great Horned Owl nest. That was a good day. 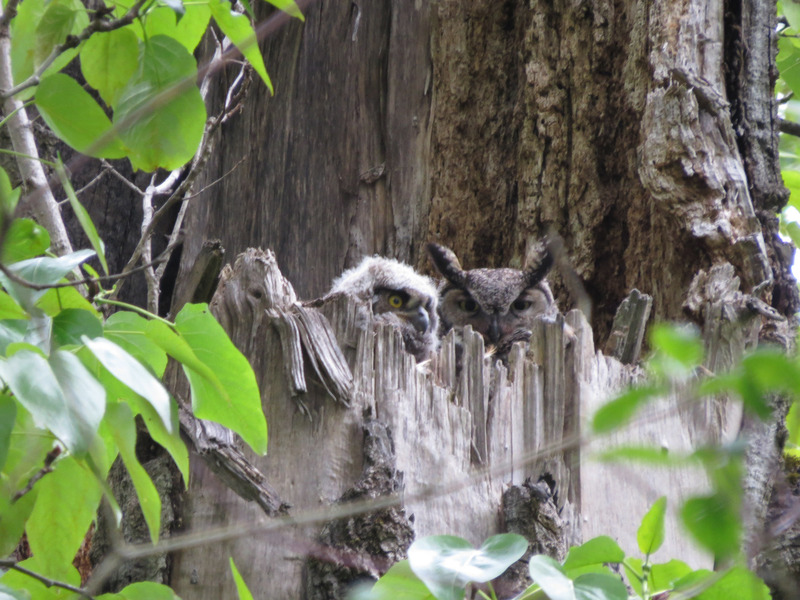 I checked on that nest again and sadly this time, no owls. This morning it was dark and rainy but I was hopeful anyways. I came across two birders on the trail that I’ve met before and we reintroduced ourselves. Dena Turner and Mary Ratcliff and I then continued along, looking for “zonos” birder slang for Zonotrichia, the genus of five American sparrows included in the Emberizidae family; White-crowned Sparrow, White-throated Sparrow, Golden-crowned Sparrow, Rufous-collared Sparrow, and Harris’s Sparrow (Zonotrichia querula). Querula is Latin for “plaintive” or “complaining” in reference to the Harris’s song. 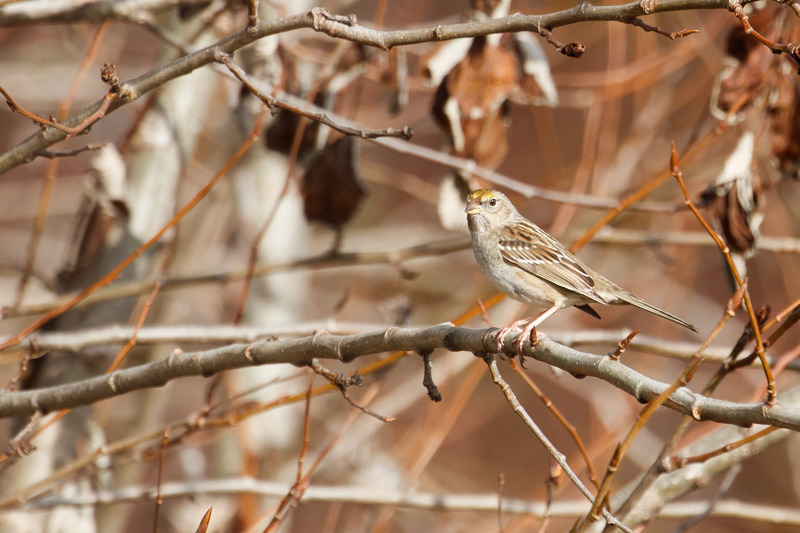 And while we’re going there, Harris’s Sparrow is named after Edward Harris (1799-1863), (not the actor), but ornithologist and friend of Jonn James Audubon. Unfortunately, the morning resulted in zero zonos. 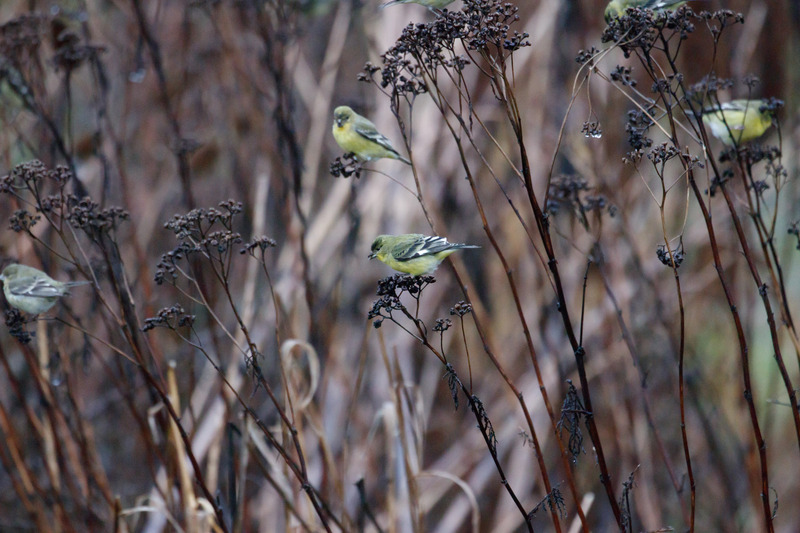 But we did see some Lesser Goldfinch or maybe call them “spins,” short for Spinus? 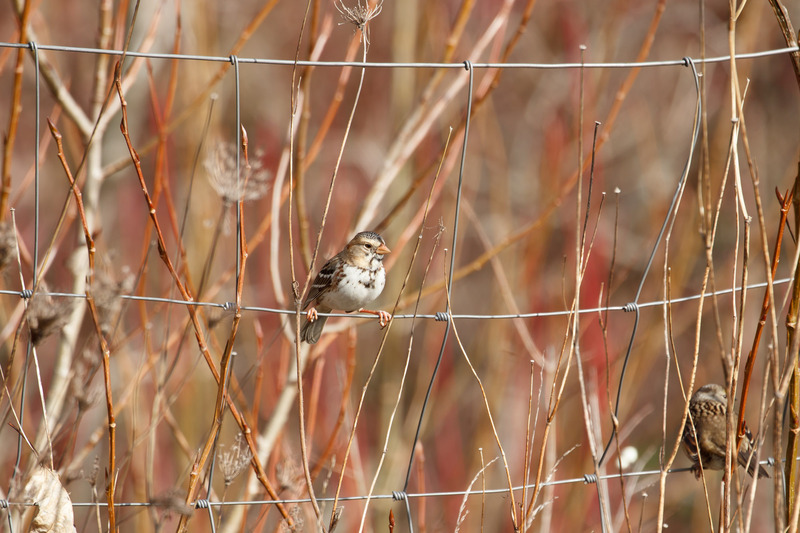 Of course as soon as I got home, someone reported the Harris’s Sparrow. *face-palm* And at this point, Tomas had taken the car to go mountain biking. What was a good birder to do? Since it was my last chance before the work week started again and I’d have no time to bird, I grabbed a Car2Go rental and headed back. It was only a 20-minute drive from my house, and I figured, I’ve spent more on a bird before. Justified. Within minutes of exiting the car, I saw my friend, Blue-gray Gnatcatcher Bill and another birder on site, and moments later I was on the bird. 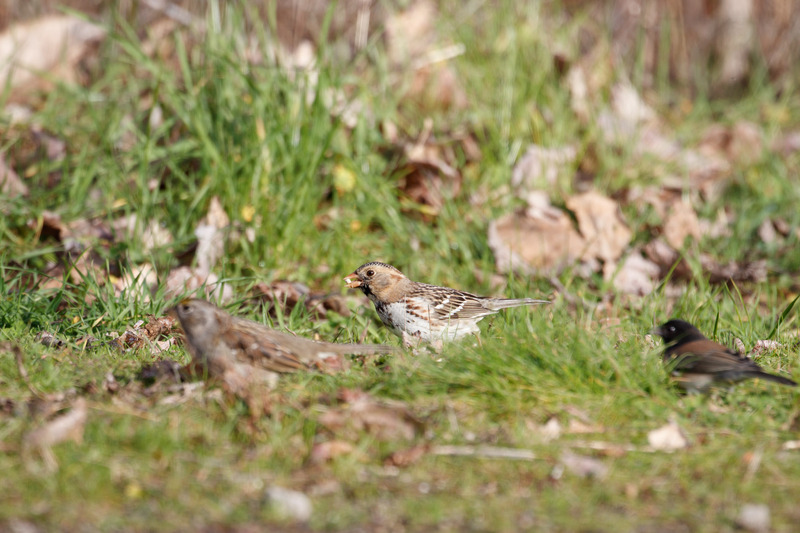 The Harris’s Sparrow hopped to the ground to munch on seeds that someone put out for the birds (thanks for that!). 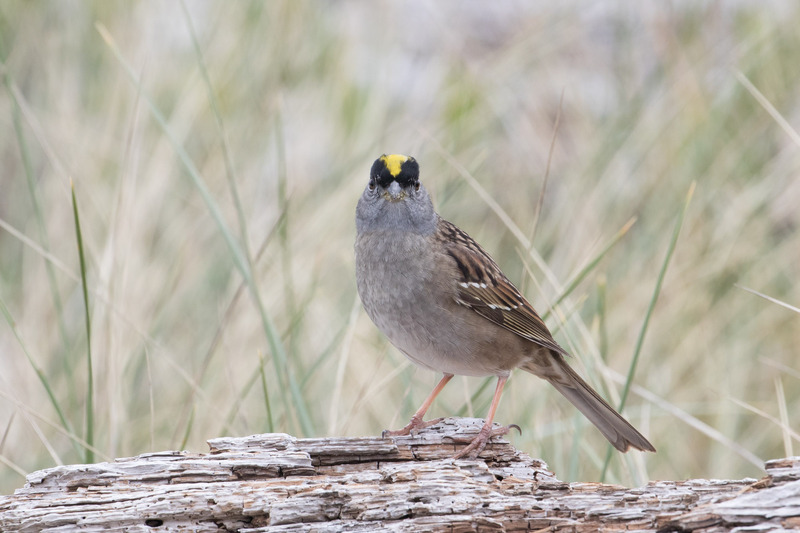 Two other zonos were present, White-crowned Sparrow (no photos), and Golden-Crowned Sparrows. 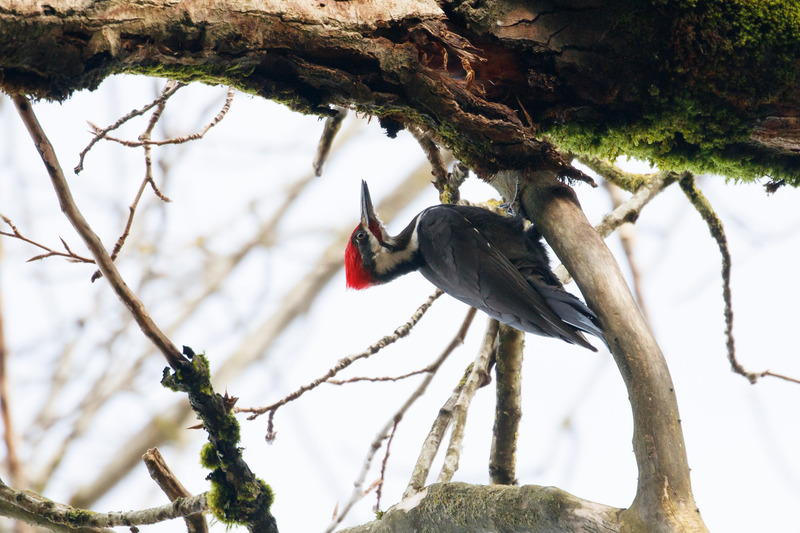 I got a glimpse overhead of a Pileated Woodpecker that I’d only heard earlier. 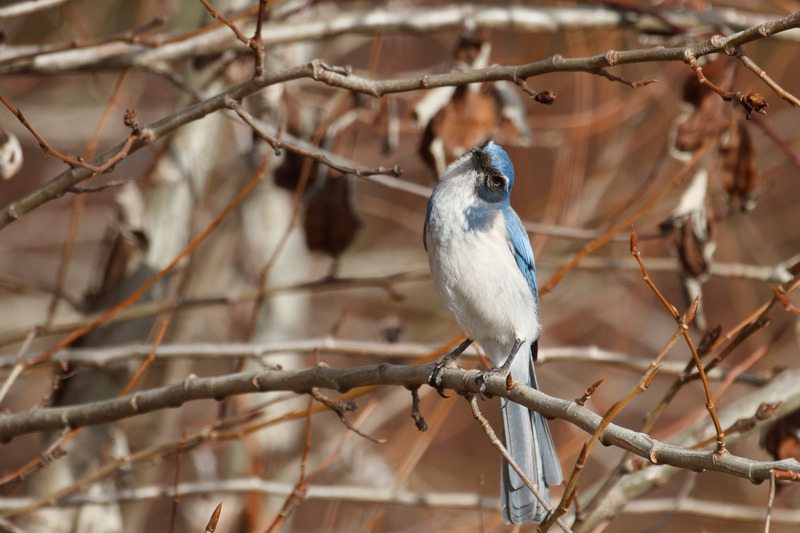 And every once in a while a California Scrub-Jay would drop in and stir up all ground-feeders. 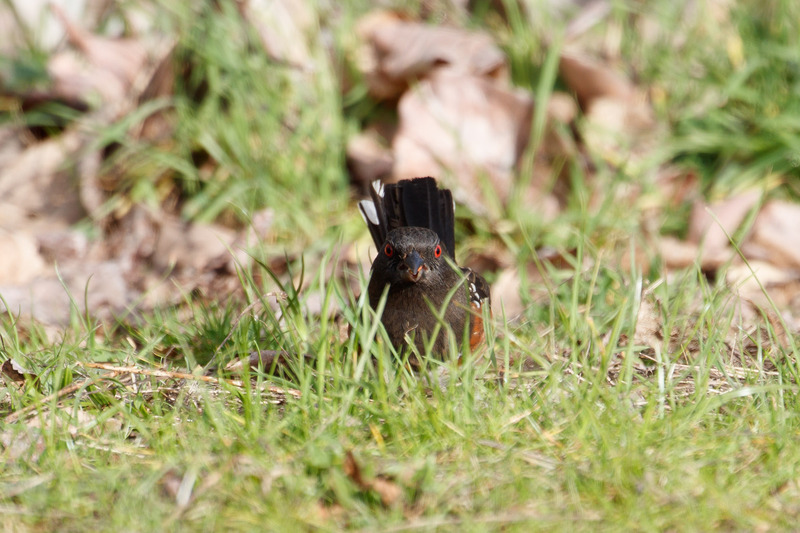 Spotted Towhees didn’t care much. And eventually the handsome Harris’s would come back. He was an ambassador for wildlife after all. I was so glad I’d gone back! It was worth every penny.